Kimchi stew is for kimchi lovers. The long simmer makes everything uniform and bright. The tofu is working some magic, we think. 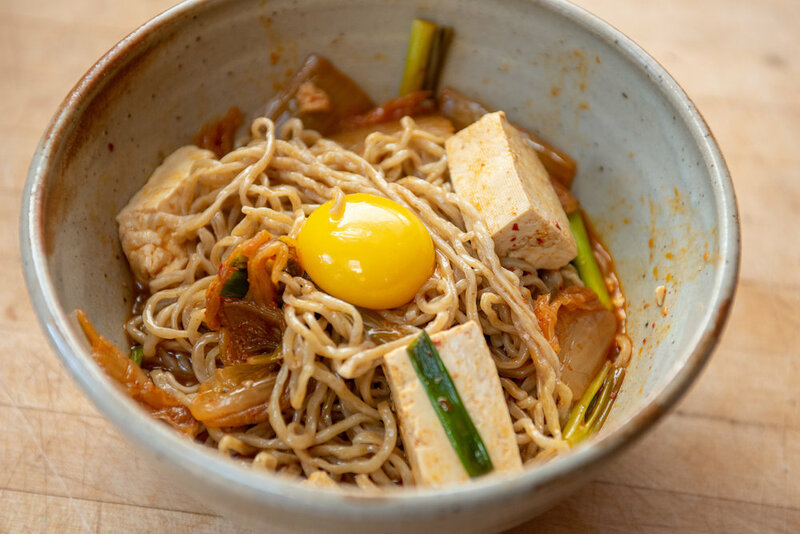 Tofu is the perfect medium for taking up all that kimchi pungency and transforming the resulting stew into something strangely delicate. Kimchi stew is also a great way to use kimchi that's getting ultra ripe in your fridge. You can eat this stew on its own, with rice, or our favorite of all, over noodles. For noodle soup, serving this with egg yolks is absolutely crucial to build body and richness in the broth. If raw egg isn't your thing, poach eggs in the stew and serve one (ideally with a runny yolk) with each bowl. 1. In a large heavy pot over medium-high heat, heat oil. Add kimchi and gochujang and cook, stirring often, until beginning to brown, 5 to 8 minutes. Add kimchi liquid and 8 cups water. Bring to a boil, reduce heat, and simmer until kimchi is softened and translucent, 35 to 40 minutes. 2. Add 1-inch scallion pieces, soy sauce or tamari, and cubed tofu. Simmer gently until tofu has absorbed flavors, 20 to 25 minutes. 3. Bring a large pot of water to a rapid boil. Gently pull apart and fluff noodles. Add noodles to water and boil 2 minutes, stirring often. Drain in a strainer and shake well to remove excess water. 4. Add sesame oil to stew and season with salt and pepper. Divide noodles between bowls. Ladle stew over the noodles to cover and top each with an egg yolk and minced scallion. If you have toasted sesame seeds, sprinkle them over each bowl.